Between 13th and 15th centuries, in the Tuscan city of Siena a great school of painting flourished, which entered in competition with the Florentine one. At the Uffizi Gallery we meet some of the greatest exponents of the Sienese school: Duccio, Simone Martini and Lippo Memmi, the brothers Ambrogio and Pietro Lorenzetti, Matteo di Giovanni, and the Mannerists Beccafumi and Sodoma. In the works of the Sienese painters we see many references to the preciousness of the Gothic style, like the extensive use of gold and the construction of delicate, harmonious and idealized figures. In those of the Florentines, however, the perspective research and more realistic figures predominate. In the Middle Ages, the rivalry between the Ghibelline Siena and Guelph Florence was not only artistic, but also political. The battle of Montaperti and that of Colle Val d\'Elsa are the most important episodes of war between the two cities, during the 13th century. In the 14th century, probably Siena reached its artistic peak: at the Uffizi Gallery there is an entire room dedicated to the Sienese 14th century. 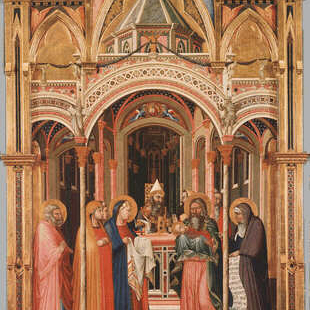 This hall shows important works, such as the Annunciation, by Simone Martini and Lippo Memmi and the Presentation in the Temple, by Ambrogio Lorenzetti. The works of the hall have similar characteristics, but at the same time exhibit differences: we see the mystical style, sometimes unreal, typical of the International Gothic style, but also the influence of Giotto, the perspective rendering of matter represented. Dialogue with Florence brought therefore points of contact and exchange, not only of rivalry. The Sienese painters carried on the local tradition, but looked at anatomical research of the Florentines. The political and economic crisis of Siena, in the late 16th century, also led to the artistic one: today the town preserves its masterpieces of painting and architecture, that give it a late-medieval appearance, endlessly fascinating.